OneTen specializes in the provision of fast, cost effective, and durable construction materials and solutions designed to meet customer specific requirements for residential, commercial, and industrial application. Combining the Light Gauge Steel Frame (LGSF) System with the latest cladding and insulation technologies, and adhering to stringent international standards, OneTen offers a complete turnkey solution, from design to handover. The OneTen team has over fifty years of, both domestic and international, specialized experience in working with the LGSF system. In-house expertise is augmented by domestic and foreign associate relationships with industry specialists. Our recent work in Pakistan’s earthquake affected areas has received recognition from donors, corporate clients, end users and other stakeholders. OneTen fully implements the American Institute of Steel Industry (AISI) Standard to ensure structural stability of its buildings. 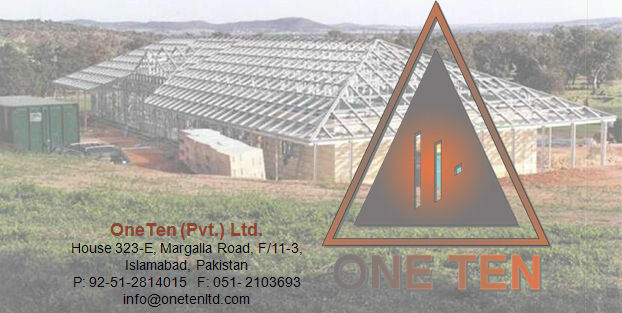 OneTen has the distinction of being the only company, whose LGSF buildings have been approved by the Earthquake Relief and Rehabilitation Authority (ERRA) and NESPAK as permanent structures. Our international standard steel profile production facility allows us to manufacture high quality steel structures. Using only the best galvanized steel and with a rigorous emphasis on quality control, OneTen’s profiles are unparalleled in strength and superiority.